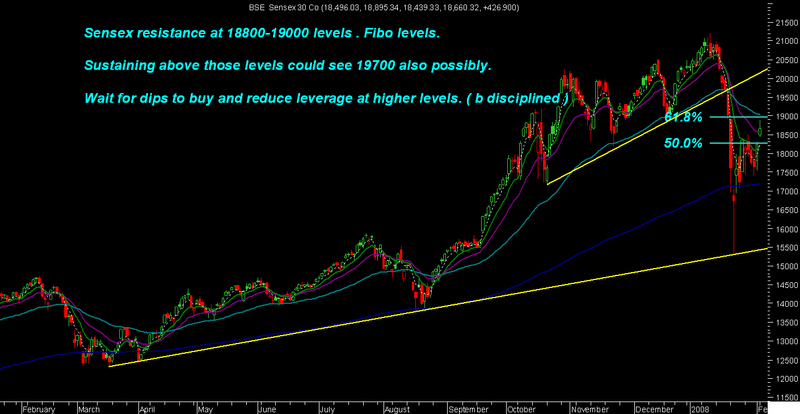 Resistance levels stated before as 18800-19000 and dips from now on should see support at 18050 and 17500 levels. As stated yesterday leveraged players should reduce and for now dont be in a hurry to re enter or again get leveraged. Be stock specific and wait for value buuying levels in particular stocks. Nagarjuna Fert , Escorts , Ispat etc did their 10-20% moves as said and was advised to book partially and wait for dips to add. Peninsula Land looks a good investment at 86-79 levels. Pennar Inds is a value buy below 24 with a view of 6 months for 30% or more gains. The course is designed in such a way that u need no knowledge of technicals or fundamentals just brief idea of mkts. The course is meant to train and make people independent and be able to analyze the way we do it in a simple manner. All those who are really interested in learning the analysis can get in touch if they have any queries .